Harrow is a suburban town in the London Borough of Harrow. Located on the edge of London, it’s near to popular landmarks including Hampstead Heath (35 minutes), Legoland Windsor Resort (40 minutes) and Twickenham Stadium (40 minutes), among others. At MET Coaches, we have served businesses, public institutions and residents of Harrow since 1995, providing quality coach and minibus hire services at competitive rates for corporate events, private trips, schools, colleges and sports teams across Harrow. With a large fleet from 16-seater minibuses to a 70-seater large coach, among them luxury coaches equipped with an onboard kitchen, toilet and tables, you can expect a high quality and efficient transport service that is fit for purpose. Just let us know the number of passengers you have and the destination, we will choose the right vehicle to suit your requirements. From sports matches to team building activities around Harrow or in central London, we work closely with your corporate events planner to ensure a comfortable and smooth journey for your clients or guests. Our minibuses and coaches are clean, well-equipped and spacious, allowing your corporate clients and team members to arrive together and on time. For corporate hospitality trips near Harrow, consider taking clients and guests to one of the multiple golf courses within 10km of Harrow such as Harrow Hill Golf Club and Pinner Hill Golf Club. There will come a time when you’re expecting clients from foreign countries, or you’re expected to travel abroad for work. For companies that need a trustworthy and efficient minibus hire company for airport transport, you can rely on us to provide excellent airport transfer services between venues or accommodation in Harrow and London Heathrow, Luton and Stanstead. We also provide transport services to top business venues around Harrow, including Wembley International Hotel. Just 16 minutes from central Harrow, Wembley International has multiple meeting rooms that offer free WiFi, a ready-to-use projector and accommodation for up to 150 guests. At MET Coaches, we help public and private schools and colleges in Harrow to carry out fun and educational trips across northwest London on tight budgets. Whether the requirement is to transport your school athletics team, a year group or every student in the school, our coaches and minibuses provide the ideal transport solution with a strong focus on safety from start to finish. Our drivers are DBS-checked and receive regular training – we make sure student safety is our top priority. The Royal Air Force Museum, about 21 minutes from Harrow, makes for a fascinating educational excursion. This interactive museum gives students the chance to learn about the history of aviation, the Royal Air Force and how they contributed to WWI, WWII and other International wars in a fun and engaging way. We have a solid reputation for working with schools. Our reliable drivers will take your group there, wait for you, and take your group back after the trip. Weddings, birthday parties, hen and stag nights, family days out, they are all important events that require a luxury minibus or a coach. Our friendly team can definitely help: with us, you don’t have to book multiple taxis and manage who should share a taxi with whom – our coaches and minibuses can take every one of your guests, and ensure they all arrive on time. 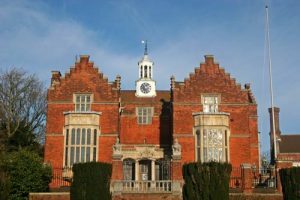 Manor houses in Buckinghamshire, Hertfordshire and North London are all easily accessible from Harrow. If you want something even closer, The Great Barn at Headstone Manor is perfect for weddings and other special occasions. With easy access to the M1, M25, M40 and London Heathrow Airport, The Barn has a comfortable, rustic atmosphere that will impress your guests and make your event a memorable one. The depot at MET Coaches is in Watford, just 25 minutes north of Harrow, which is why we can provide excellent transport solutions to companies, institutions, local clubs and families in Harrow at a highly competitive rate. Give us a call today on 01923 247765, and we will take you and your group to events around Harrow, across and outside of London, safely and efficiently.